This weekend was just supposed to be about my 20 mile long run. Get through that 20 miler and then my taper can begin. The one problem was that I also had to run the Staten Island Half Marathon in order to get my guaranteed entry into the NYC Half in March. I told myself I wasn’t going to race it, after all I got my half marathon PR last week. Really, I didn’t race it. I ran it at a comfortable pace. I never felt out of breath or that I was pushing myself like I did last week. Well, wouldn’t you know it I got another PR. Took off close to another two minutes. The original PR that I had been trying to beat for the past year and half was set in 2009 in Philadelphia, a mostly flat and fast course. I still take exception to this with that giant hill around mile nine, that thing just hurt. Anyway, as you know it took me a year and half to beat that almost four year PR and just one week to beat this new one. Funny how that just works out like that. I was starting to obsess over that number and sure enough when it was no longer an issue a new PR just happened. That’s the attitude I’m trying to take with me as I enter my taper and make my final preparations for this year’s marathon. I’m fairly confident that I’ll get a PR but it’s just a matter of what that final time will be. I am NOT going to have panic attack thinking about my “A” goal. No, I won’t. Of course, that’s what I say now. 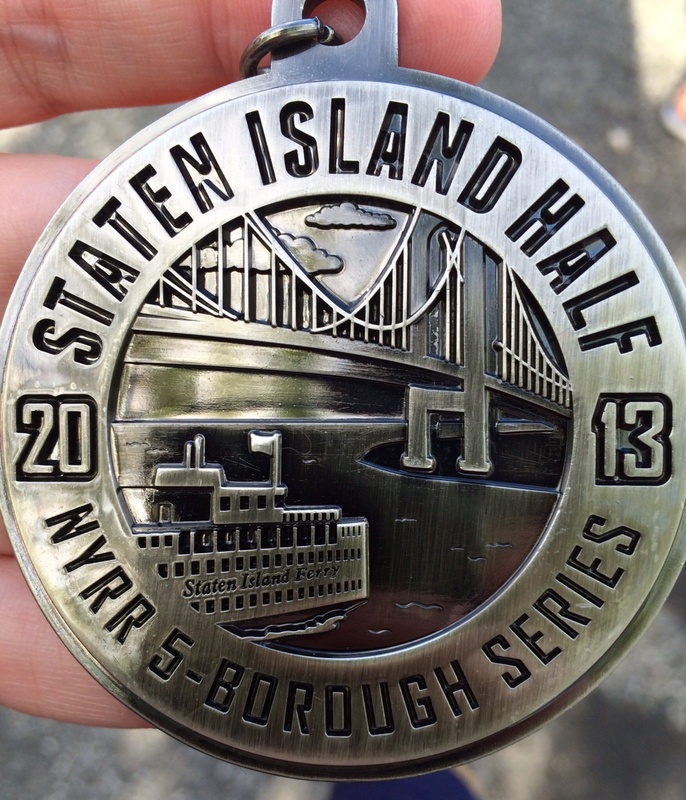 This entry was posted in Half Marathons, NYC Marathon, Race Recap, running and tagged NYC Marathon, NYRR, Running, Staten Island Half Marathon, training. Bookmark the permalink. Congrats on the 2 PRs. It looks like your training is going well. The medal looks great. Do you ever hang up your medals? I used to toss them in a drawer but recently started a home based company to make affordable frames to display medals. If you are interested you can check my blog for a link to my business web site.